Big winner for the Marian Collegiate/Texas Roadhouse Cycling racers! Congratulation to a few of our team riders who moonlight for Marian University… Zach Carlson, Brice Brookshire and Jos Chalmers. 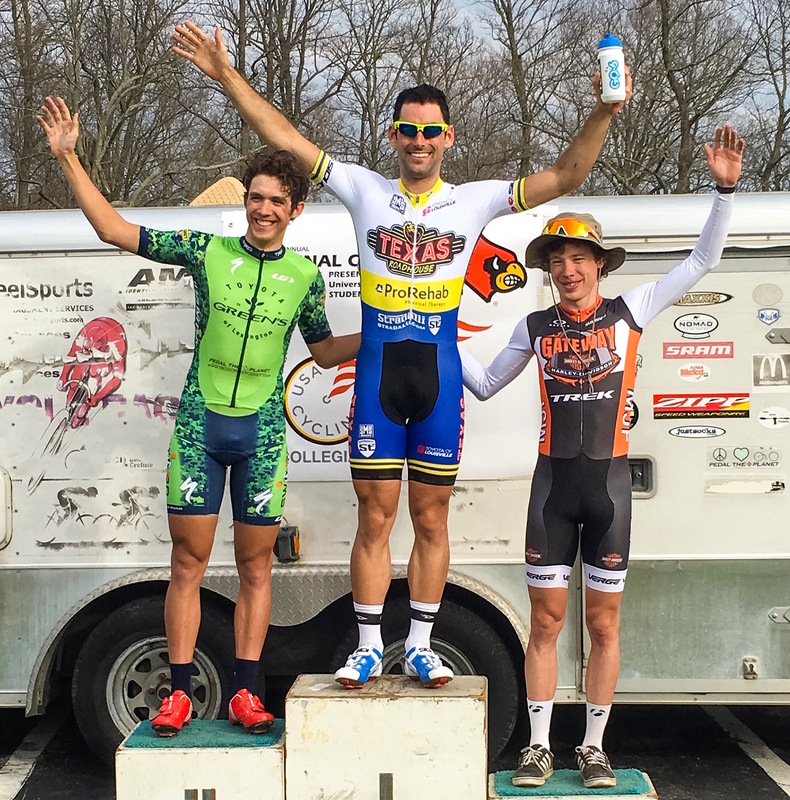 They raced the Lindsey Wilson Collegiate over the weekend with great success. Crit – Jos and Jordan active in the early moves to set up the winning move w/ Zach and Brice in the mix. Zach wins with a flyer from over 1k out (video), Brice slides in at 4th. Jos controls the last 3 laps in the field to set up Jordan for the field sprint win. TTT – Jos, Brice, Zach and FIB rider Ben Shmutte win by over 30 seconds over Marian’s second team, over a minute faster than 3rd place. 28~ mph Avg on a rolling hilly course. Road Race – strong 6th place finish from Zach in a tough hilltop sprint. A Win at Long Run! CHICAGO, IL. (USA) In what is the best way to start the 2016 season the heavily favored Texas Roadhouse Cycling Team pulled off a photo finish sprint win at the First Annual Cardinal Criterium at Long Run Park in Louisville, KY. After rain showers passed through the Louisville, KY area mid-day Saturday, March 13th it quickly became the hottest day of 2016. With the sun out and temps reaching 73º a hot and hard fight began at the sound of the start gun. But with a large contingent of Texas Roadhouse riders in the field many thought controlling the field would be the key to victory. The question was who, on the team, would be the one to contend for the number one spot. In the end, it was new team member Brice Brookshire (25), Indianapolis, IN who took advantage of a two-man breakaway late in the race to sprint for the win. However, It was not easy for Brice. When he started his sprint the chain jumped a ring in the front. Brice quickly recovered and dug deep for every watt he could muster. The final pedal strokes to the uphill drag race finish proved to be just what the second year med school students needed to take the win by a whisker. And with that, the season is underway! The 2016 Season starts this weekend in Long Run Park! Come out the Long Run Park, 1605 Flat Rock Rd. Louisville, KY 40245 around 2pm on Saturday March 12, 2016 to cheer on the squad. Come check out our awesome Stradalli bicycles as well. Working on an updated site. Stay tuned! 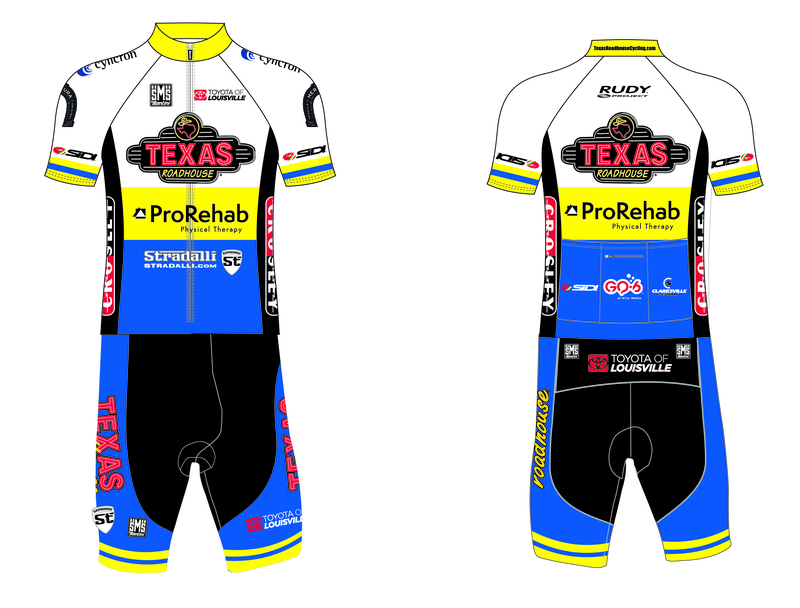 Daniel Holloway beefs up the roster for Texas Roadhouse Cycling! Jordan Marhanka wins the Indy Omnium in dominating style!